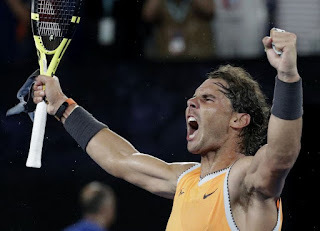 Rafael Nadal beat Stefanos Tsitsipas 6-2, 6-4, 6-0 to reach the Australian open final. Coming into the match, it seemed like Tsitsipas would give Nadal a challenge. In the round of 16, Tsitsipas came back from a set down to beat Roger Federer. But Nadal looked masterful throughout. In the final set, Tsitsipas didn’t win a single game. Nadal is 32, and is doing his part to rebuff the narrative that younger tennis players — the next generation of stars — is ready to take over. Three of Nadal’s last four Australian Open opponents have been young. He beat 19-year-old Alex de Minaur in the round of 32. He beat 21-year-old Frances Tiafoe in the quarterfinal. And Tsitsipas, Nadal’s most recent vanquished foe, is just 20. Nadal didn’t have the best 2018. He managed a few key victories, but he was beset by knee, hip, ankle and abdominal injuries. His 2019 is starting off on the right foot, though. He’s yet to drop a single set at the tournament, and he’s just one win away from being the Australian Open men’s champion. And it means a lot to him — he got emotional when he entered the walk of champions. Rafa will play the winner of the match between Novak Djokovic and Lucas Pouille.